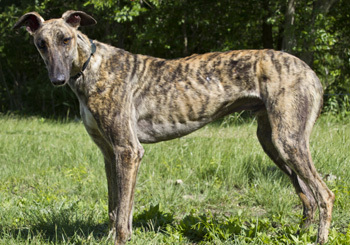 Henry is a 5-year-old brindle male born December 1, 2009. His sire is Craigie Whistler and his dam is Fuzzy's Snowball. Henry has no races to his credit and has not been individually registered with the NGA. 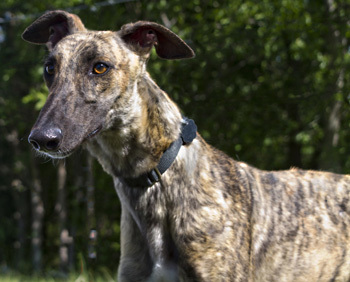 Henry was in a home for two years, but has returned to GALT due to a change in family circumstances. Is this big, handsome boy looking for you? Henry is not cat tolerant at this time and would prefer a home with no very small children. Henry is a very friendly, happy boy who is having fun learning about the joys of retirement! He likes to get daily walks and loves to play with toys (although he is a bit rough on them). He also loves to interact with other dogs, and is very playful with them. He loves any kind of treat and is learning to roach (lay on his back) on the dog bed. Henry's manners are coming along nicely. He crates well and walks nicely, and does not counter surf or have accidents in the house. He rides well in the car but is still learning to jump in and out of the vehicle and may need a tiny bit of help!